Home Football Manchester United And Paris Saint-Germain Charged By UEFA! Manchester United And Paris Saint-Germain Charged By UEFA! Manchester United have been charged by UEFA after objects including a bottle were thrown at Paris Saint-Germain star Angel di Maria in Tuesday's clash. 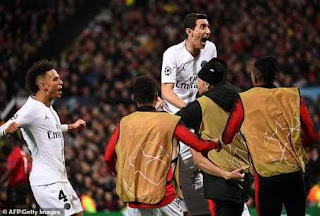 However, Di Maria has avoided a suspension for telling fans to "f*** Off" after PSG's opening goal in their 2-0 UCL win. The 30-year-old Argentine was clearly fired up for the occasion and was booed by United fans who have not forgotten his ill-fated season at United in 2014-15. United now face a fine for the bottle incident involving Di Maria, who took the corner that led to PSG’s opening goal for Presnel Kimpembe. UEFA also looked at Di Maria’s behaviour although it seems they will not take it further, deciding only to charge PSG over their fans setting off fireworks. According to Manchester Evening News, around 800 seats were ripped out or broken during the match, while netting was ripped down. "Our fans created a great atmosphere getting behind the team last night," a United source told the MEN.